(CNN) -- The mother of slain congressional intern Chandra Levy says she has been told by police in Washington, D.C., that an arrest is imminent in her daughter's 2001 death. CNN senior legal analyst Jeffrey Toobin says jailhouse confessions are notoriously weak evidence. CNN anchor Christine Romans spoke Monday with CNN senior legal analyst Jeffrey Toobin about the case. Christine Romans, CNN anchor: A developing story we're watching right now. A murder mystery that gripped the nation and ruined a congressman's reputation eight years ago may finally be coming to a close. Today, D.C. police are said to be ready to make an arrest for the murder of Chandra Levy. 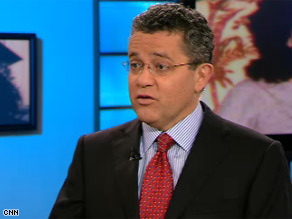 CNN senior legal analyst Jeffrey Toobin joins us now. Jeff, welcome to the program. We're learning about this man already in prison, Ingmar Guandique, who reports say police are close to arresting in this case. This is an eight-year-old case. What new do they have now about this eight years later? Jeffrey Toobin, CNN senior legal analyst: Well, for those of us who have been following this all these years, Guandique is not a surprise suspect. In fact, one of the big questions about this investigation is why wasn't he focused on earlier. Romans: And why wasn't he? Toobin: ... in Rock Creek Park. Romans: ... even after it had been really combed over by police. Toobin: Right. She disappeared in May of 2001. In July of 2001, which is just two months later, Guandique attacked two joggers in Rock Creek Park and got a 10-year prison sentence for doing that. Very similar crimes. He's now in federal prison in California. So, he's been a focus of investigation for a long time. Now, there are reports that there is new DNA evidence and perhaps even a jailhouse confession leading to Guandique. Romans: Before I ask you about the jailhouse confession, let me ask you about the DNA evidence. Eight years have passed. There are quite a few differences and much more technology in DNA testing, right? Toobin: ... that -- smaller samples, more degraded samples can now be used in such a way that it can be admitted as evidence in a criminal case. Maybe that's what's at work here. Romans: But you're not necessarily convinced that jailhouse confessions are all that reliable. Toobin: You know, jailhouse confessions are one of the most notorious sources of evidence, especially in high-profile cases, because prisoners are very crafty. They know that if they can come forward with good evidence in a high-profile case, they can sometimes lower their sentences. You know, when you hear about people being acquitted years later on DNA evidence, often you'll find that they were convicted on jailhouse confessions. It's very, very notoriously bad evidence. DNA is great evidence. So, we'll see what the cops have here. Romans: And this was a high-profile case. We've gone almost two minutes without saying the words Gary Condit, the former congressman whose reputation was essentially ruined by this whole affair, if you will. Toobin: If you will. Yes. Romans: If you will. So do you think that the focus and the attention on Gary Condit from the very beginning detracted from the investigation and the focus on this new suspect? Toobin: ... was probably a distraction to a lot of people. The cops will say they weren't distracted, but certainly the Washington police did not do their best work in this case. I can't say it's because they were thinking about Gary Condit, but certainly, you know, Gary Condit deserved the criticism he got for having an affair with an intern. Certainly, that's inexcusable behavior, but it is clear now, and it's been clear for a long time that he didn't kill Chandra Levy. And I think in that respect, his reputation deserves to be rehabilitated. Romans: Well, finally, eight years later, maybe this mystery gets put to rest, and this family, this grieving family can finally get some closure. Jeff Toobin, thanks so much, Jeff.